A paper published by Roy-Leveillee and Burn (2017) in the Journal of Geophysical Research- Earth Surface reports observations of permafrost degradation and talik development beneath water depths less than 15% of the maximum ice thickness in lakes of Old Crow Flats, northern Yukon. 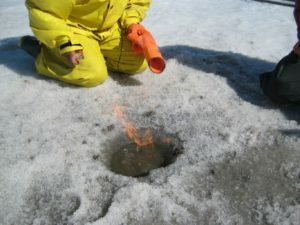 This is surprising as, in the near-shore zones of thermokarst lakes, it is generally assumed that permafrost is sustained where water depth is less than 60% of the local maximum ice thickness. The paper investigates controls on permafrost degradation and reveals that sub-lake permafrost is sensitive to on-ice snow distribution where the water column freezes through. It shows the importance of the thermal offset where conditions are marginal for talik initiation and highlights the role of interannual variability for prompt talik initiation near receding shores. 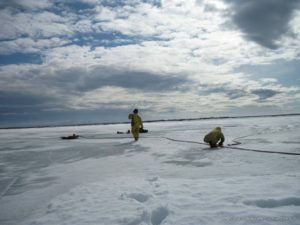 These findings improve understanding of permafrost degradation beneath shallow water, a topic of particular concern in the context of climatic warming as methane release from thaw lakes is concentrated near receding lake margins and is most active at the thaw front beneath the lake bottom. In July and August, Emma, Nathan, and Pascale visited the Blackstone Uplands, Yukon, to investigate field conditions at sites that showed signs of increased permafrost degradation between the 1950s and early 2000s. The data collected will be used for Emma’s honor thesis, as she will examine the distribution of thermokarst features in the Blackstone River valley and discuss terrain characteristics at the affected sites. 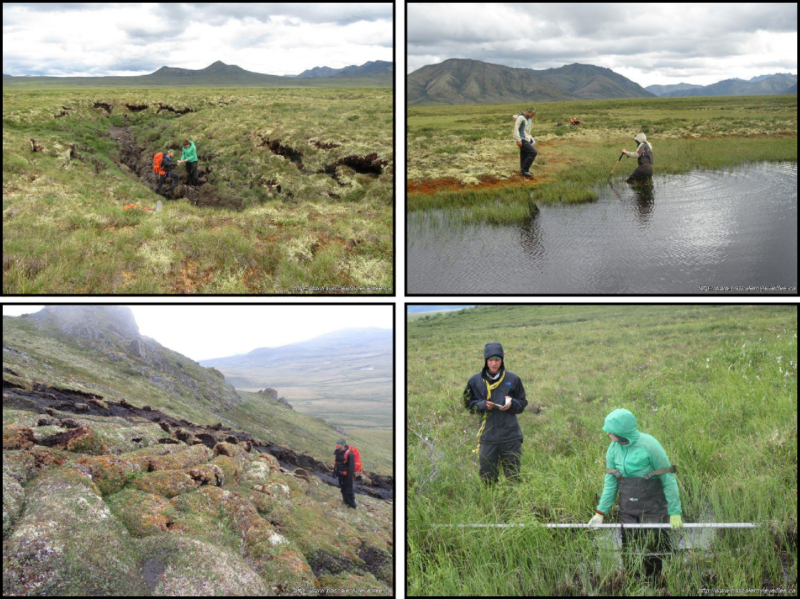 Photographs of thermokarst features in the Blackstone Uplands and some field work photos are found here, and more pictures of students hard at work in the field are found here. Nathan and Emma’s field work was made possible by funding from the Goodman School of Mines and the Northern Scientific Training Program. Thanks to the Na-Cho Nyak Dun and Tr’ondëk Hwëch’in First Nations for allowing us to conduct field work on their traditional territories. Clockwise from top left corner: Degrading ice wedges and thermokarst tunnels; Expanding ponds; Active-layer detachment slides; Developping beaded streams. All photos taken in the Blackstone Uplands in 2016, by Pascale Roy-Leveillee.